E-beertje came along to see how far I was with the sofa and he wanted to try it immediately! Hmm...it is very soft M-tje, it just tickles my buttocks a bit!!! Yes silly bear...I only have the backpart ready!! You's sitting on bare fiberfill, that's not really comfortable! But why isn't the sofa ready?? You always work so fast! so when I get back from work I will continue with the sofa, okay? and she brought such a sweet gift!!! A little doll, bought in the fair trade store! because she has a lady bug (in dutch lieveheersbeestje) on her skirt! Of course someone wanted to try out the new sofa!! the sofa we borrowed was just a bit too small! So Z-beertje came with E-beertje to try the new sofa! And it sits perfectly!! Does the sofa feel good enough Z-beertje??? Yes E-beertje, it is very soft! And do you like the color?? Otherwise I will ask M-tje to make another one! The color is beautiful E-beertje and I love the little flowers! Well, alright then...M-tje, we are satisfied! And now we want 2 matching chairs!!! 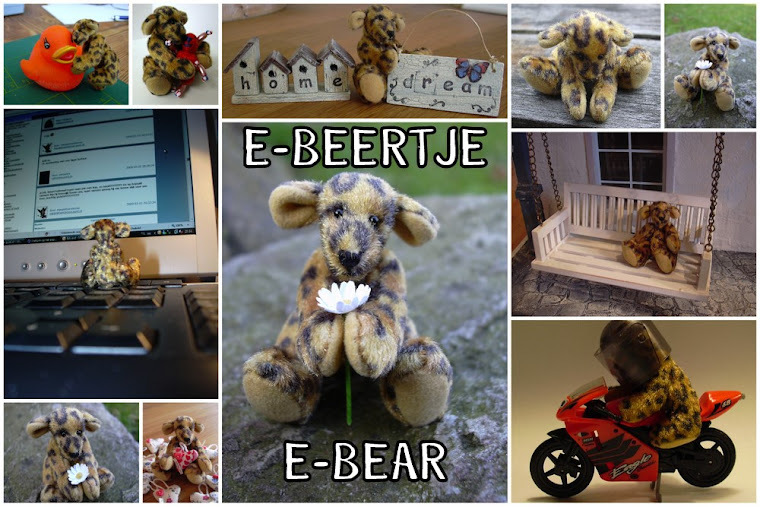 Pffff, okay E-beertje, but NOT today!!! Es un sofa precioso, me encanta el color y el dibujo tan chiquitin que tiene.